Sharpen your pencils, put on your thinking cap, and prepare yourself for some serious nostalgia with our latest drawing challenge sponsored by 3Doodler. We're taking it back to the days when you were an artistic little nugget by challenging you to illustrate your childhood imaginary friend using our PDF template! Whether it was a human, a robot, a monster, an animal, or even an alien makes no difference. All we ask is that you take full advantage of this one and let your creativity run rampant. 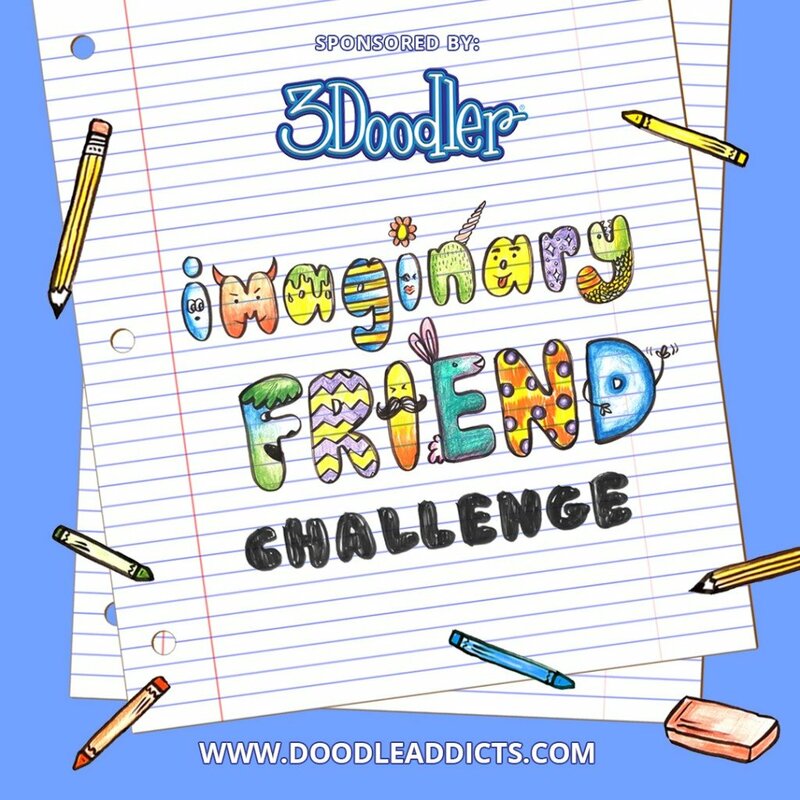 The grand prize winner will see their trusty imaginary friend come to life courtesy of a 3Doodler master artist, and will also receive a brand new 3Doodler Create+ Master Creator Set, so let your inner child run free and doodle away! Introducing the All New 3Doodler Create+ 3D Pen: Discover a whole new way to Create & Fix! Click to extrude heated plastic which hardens rapidly, allowing you to draw in 3D, freehand, or using stencils. A fun & easy way to accomplish any project. Make art, fix things, design wearable items, build models, and decorate your space! Now with new Dual Drive Technology. The latest model of the world's original 3D pen features improved power, durability, and reliability for an unrivalled Doodling experience. My imaginary friend as a kid was a monster travelled from telephone pole to telephone pole, and it always dangled the moon in front of me. This creature has green moss growing out of its back and stick-like antlers extruding out of its head to improve its camouflage in the woods. Not only is my imaginary friend cute and cuddly but it is also agile and stealthy. The shiny scales that cover the lower half of its body provide protection to the creature. Overall, this imaginary friend is amazing in every way. As a child, I'd read Shakespeare's Romeo and Juliet and a brooding, Goth like Juliet became my imaginary friend. She would sit on a swing and be my muse. my imaginary friend is based on my long lost cat, that was fun to hug, fluffy tail and I added some features for him to be more big and more protective. Uecothecoei is a rapper and likes do sing a lot! He is funny and very crazy. His preferred color is red, and he loves peace symbol. I found a picture of me as a kid talking to my hand. I had forgotten my hand had a voice and a personality. Maybe there were several imaginary friends that inhabited my hands at one point, in this picture I'm trying to give them some fur and feathers. I wish I remembered their names. This is my childhood friend, JellyGlo. She always would float around my room in the dark to help me get over my fears of the dark. She's my best pal, and always will be. my friend name is Botto. A robot with body that can change into any machine such as drinking machine, television, radio and more. Have a hands and legs that flexible. She was a fierce and brave indian girl. We used to build stuff and horseriding together. A fearless, yet occasionally apathetic young lady with the unnerving ability to transfer her own feelings and emotions to others without retaining them herself. She is disturbingly fond of her pocketknife. My imagination Friend Dodo, is a told one, with many haïr every where. Hi lives in the Mountains where it is snowie the Wohle Time. Every Kid loves sweets and Midnight is no exception. Midnight is a donut grabbin', Candy eating, Cookie snatching kitten that flies through the kitchen in the wee hours of the night to gather all the treats your mother said you just couldn't have. Obibli is very funny and likes to frighten people. His preferred colors are purple and green. Be careful! He is Karate black belt. This is Onkie. He is a MINECRAFT pig but a very special one! My imaginary friend was Max, whom I would describe now as a giant carnivorous Phoenix Pigeon! He has shiny silver feathers (I would always color him with a silver prismacolor instead of grey) except for the inside of his wings which are rainbow. He also had a wife named Julie and 3 rainbow kids. This imaginary creature is one I plucked and drew straight from my head. He is a large wolf-life beast who is a strong, protective, happy-go-lucky and loyal companion. In My daydreams I can either take the form of this species and take to the skies (female version), or other dreams I climb upon him and together we soar the world on wonderful adventures. Drawn purely in byro and fineliner. My 10year old daughter drew this imaginary friend. My friend says "how can I help" so I can ask him to do things like make a sandwich. He sometimes helps me get my thoughts out. If I need to write an assignment, and can't think of anything to write, he makes suggestions. If my hand hurts, he will write what I tell him to. I feel lucky to have him by my side. The friend every nerd needs. Graphic pen, gouache, pencil crayon and digital. "TWINS" My older brothers were in college or the militaary, the twins were six years younger than me. I was a "middle child" in the truest sense of the word. So my imaginary freind was a twin brother. We'd draw, read comics, play outside, go to the beach and watch TV together. My older brothers have passed away, the twins have families of their own, I sometimes wish my imaginary twin was STILL with me. . .
Orc Rabbitan. A half-rabbit, half Orangutan, and an Orc warrior. Our treehouses and forts were always the place our imaginations ran wild. Lucky for this one her treehouse is more than willing to run "off with her"! The greatest gift of life is friendship, and she(in picture) is my imaginary friend. My imaginary friend is a cat like dragon that likes to sleep. He has tiny flame ball shaped wings and a leaf like tail. He’s shy, quiet, and extremely timid. His name is Felix. I doodled this with my new bought ipad pro and use Procreare and Graphic.Probably It’s my first iPad pro drawing :-D This creature is the guardian of the magical cards, named Cerberus, from a Japenese comic called CARDCAPTOR SAKURA, Cerberus acts as a guide and also a best friend of a ten-year old girl:Sakura. The comic was first published on 1996, and became popular to girls at this ages all over Asia. Almost every girl secretly hopes to have a magical guardian beast like Cerber, just like the Harry Potter‘s owl Hedwig, or the Black cat Luna in the "Pretty Soldier Sailor Moon". I draw this because after 22 years the animation create a new story line and the heroine Sakura only grew up two years, while we girls begin to face the childhood of our next generation. This is my Imaginary Friend, Eumelia, from when I was six to roughly ten. I used to go outside into the lagoon shaped pool behind my house and swim in the crystal clear water everyday on summer breaks. I would submerge myself beneath the chlorine tinted ripples and imagine the ocean filled with sapphire colors and creatures that could live and breathe in a world of jewel toned colors. They would sing songs beneath the waves and I would join in, listening to an underwater chorus of ethereal voices that only I could hear.